William Andersen, the Judson Falknor Professor of Law, joined the Law School faculty in 1964, after three years as associate general counsel of the then Federal Aviation Agency. In his almost 40 years on the faculty, Professor Andersen served five years as associate dean, and taught a number of courses, including Administrative Law, Constitutional Law, Urban Government and Antitrust. He has published in all these fields and is the co-author of a casebook in Antitrust. He has been active in national legal education matters with, among others, the American Association of Law Schools, American Bar Association, Law School Admissions Council and the Center for Computer-Assisted Legal Instruction, as well as serving on a variety of state and local boards and commissions. Professor Andersen has been a visiting faculty member at the University of Michigan Law School, Copenhagen University, Columbia University School of Law and the Chicago-Kent School of Law. He has lectured in several European countries and was the Freeman Senior Professor of Law at the Johns Hopkins/Nanjing Center for Chinese and American Studies. 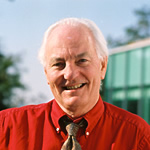 Between 1995 and 2001, Professor Andersen was chair of the New Law School Building Committee, which produced the design for William H. Gates Hall.